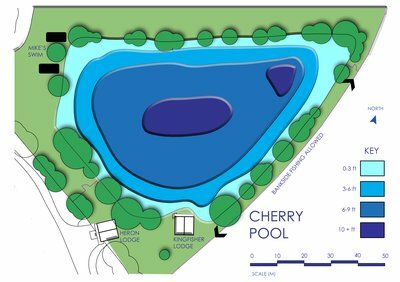 Cherry Springs is the biggest of our exclusive lakes. It is normally one of the most popular of our Lakes/Lodges. When you book Kingfisher Lodge this beautiful tree lined lake of around 1.3 acres is all yours for the duration of your stay. Cherry Springs is heavily stocked with 450+ Carp with a good range in their sizes. The majority are Mirror and Common Carp including a good sprinkling of Ghost Carp which are easily seen on the surface of the lake on bright days as they swim near the surface. 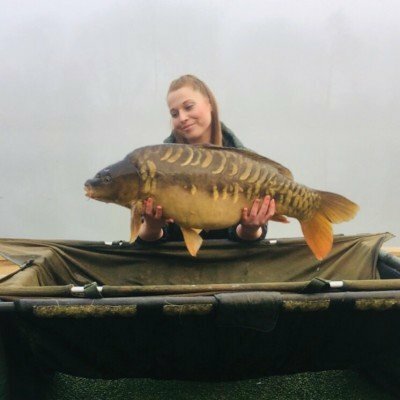 The Carp are normally catchable throughout the year and respond well to well positioned rigs and sensible baiting levels depending on the time of the year. Most of these Carp are doubles with plenty over 20lbs. Our normal rule of thumb is to expect at least one over 20lb in every ten Carp caught. The lake record was set in October 2018 by Steve Keen with a 30-12 Mirror Carp. Due to the large number of Carp in Cherry Springs, it has no weed. Cherry Springs also contains around 100 Tench, plus a good stock of Crucian Carp and Roach. These fish can be caught, along with smaller Carp and Perch, by using float and match tactics from the deck of Kingfisher Lodge or along the bank. 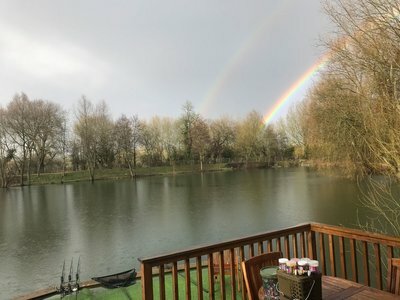 Kingfisher Lodge is ideally placed allowing all of the lake to be accessed from the large fishing platform.The fishing platform was extended in the winter of 2018/19 making it ideal for two anglers to share. There is enough room for three anglers to share. The fishing platform is also very comfortable to fish from. The astro-turf ensures it is clean and it is not slippery in the frost and drys quickly after any rain. Almost all of our guests have commented about how comfortable the ‘grass’ is and how much they have enjoyed fishing on it. Its great advantage over real grass and other surfaces is that it is always clean, easy to walk on and good on the eye. . 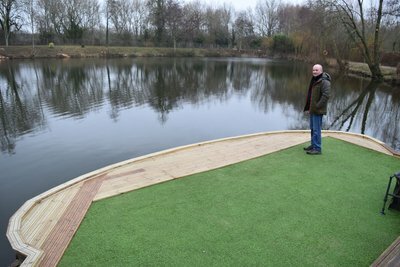 The new Kingfisher fishing area. Fishery manager Dave is well pleased with his efforts! Cherry Springs is being developed to ensure the average angler should catch several Carp or more a day. The fish will responds to most methods most of the time. Like all waters though it can switch off for a while! Reading the guest book in Kingfisher Lodge indicates that many anglers have frequently caught more than 15 Carp during their 3-7 day stay. A catch of 76 Carp during a week's stay by Richard Mascall in 2018 is the record! It is a particularly good winter water due to the stocking levels. The Carp can never be too far away even if they are not biting. Like all lakes though it can have it’s off days! 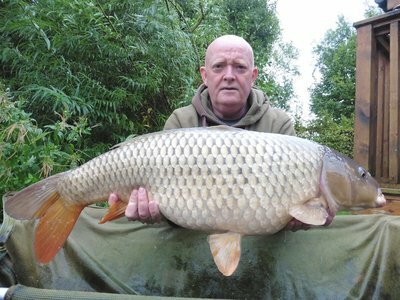 Richard Mascall with a 20lb+ Common. One of his record 76 Carp haul. Cherry Springs average depth is around 6 feet. Most of the lake bottom is covered in a layer of silt. This is not normally too deep or smelly to be a problem. The Carp do like to feed in it and can often be seen 'bubbling' in it. A great sight when you are waiting for a run! All Lodges and Cherry Lake Cottage are provided with Carp Cradles, a 42″ Landing Net and a Weigh Sling, so there is no need to fill up the car with these, and avoid the wet fishy smells on the way back from your holiday! All Carp caught must be photographed over the Carp Cradle and returned to the water in the weigh sling.